The coral reefs of Aqaba Marine Park are a wonderful gift of nature for the people of Jordan. Over 10,000 years, the corals have formed the basis of a complex web of life which rises up from the depths into the sunlight right on Aqaba’s doorstep. The economic value of Jordan’s coral reefs is high as they form part of the Golden Triangle tourism promotion scheme. The impact of visitor activities on the coral reefs, however, often goes unseen beneath the waves, and over time, these impacts can create serious challenges and impacts on economic development. One such activity is fishing. 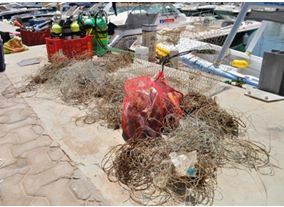 Fishing is illegal in Aqaba Marine Park. Despite the best efforts of rangers, fishing still occurs in some areas of the Park, mostly at a low but persistent level. 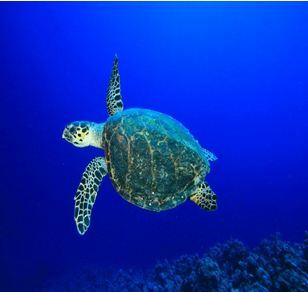 Fishing gear impacts on turtles, fish and other wildlife by ensnaring them; blocking their access to resting areas; changing the structural character of the reef when the amount of fishing gear is high; and, by breaking off pieces of coral when the gear is entangled with the reef structure. Fishing and other debris can erode the economic value of the reefs. Dive centers report that they already avoid about one quarter of available dive sites due to the presence of fishing and other debris. Economic margins at most dive centers are narrow, and fishing impacts on the dive sites impacts on their economic development potential. Although addressing fishing is a core responsibility of the marine park, the extent of the fishing debris at some sites has become so great, over such a long time, that it requires a specifically resourced project, and specially trained divers to remove it. While dive centers are involved with the removal of trash from dive sites, marine park staff are reticent to involve general divers in the removal of fishing and industrial debris due to the damage that may be caused to the coral reefs. Much of this project also involved technical expertise in deep diving and the use of specialist gear. The value of the partnership between the Aqaba Dive Association and the Aqaba Marine Park is in the cross promotional opportunities and shared responsibility to educate the wider public about the impacts of fishing on the fragile coral reefs. Marine park staff recently carried out a survey to determine the extent of the fishing gear problem. During the project we discovered six coral reefs (of about 24) that had been severely impacted by fishing gear over time. These are Kiwi Reef, Moon Valley, Yellowstone, Eel Canyon, Black Rock and Ras Yemenea. 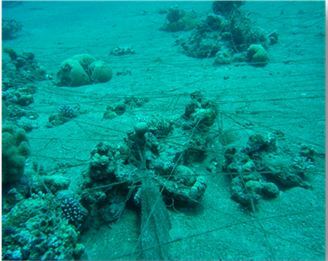 There are also often ropes and lines entangled in the coral reef at these sites, as well as old mooring blocks and other industrial debris. This debris will also be cut, untangled from the coral and air-bagged (floated) to the surface and collected. 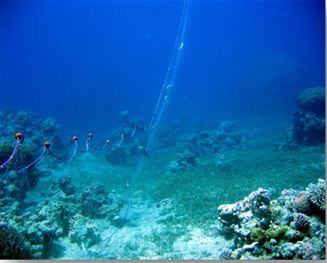 Staff also recently carried out a pilot project at Kiwi Reef and Moon Valley to test environmentally sensitive methods of removing huge quantities of fishing line and nets from the coral reefs without damaging the reefs in the process. A report about the success of this project is available on request. They key is to used trained personell and a well thought through dive plan, so as to avoid damaging the corals and to avoid divers becoming entangles in the fishing lines. General dive volunteers are not recommended for this project. Present solutions to the fishing problem to management via a report and presentation to the ASEZA Environment Commissioner, using the footage and photos collected during this project. Develop a poster (1000 units) for distribution to schools and for presentation at tourism and local venues. I would personally coordinate this project, in liaison with Aqaba Marine Park and the Aqaba Dive Association. The small, highly specialized dive team would build on the experience from the pilot study we recently carried out. I would involve experienced park rangers, whose skills can be refined, and the Dive Aqaba PADI Tec Rec Centre, which is very professional and already carries out extensive volunteer work in the marine park. Highly trained deep divers from Dive Aqaba will be used at the six sites to remove fishing gear from waters between 30-70m depth. Dive Aqaba PADI Tec Rec Centre was involved in the pilot project. Aqaba Diving Association would host the grant, enjoy the benefits of cross promotion on the education materials about fishing and assist with their distribution where possible.